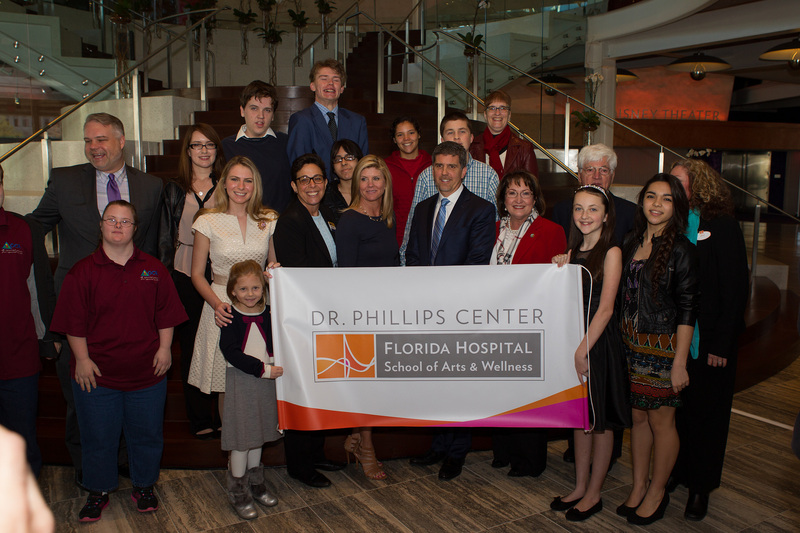 The Dr. Phillips Center School of Arts will now be the Dr. Phillips Center Florida Hospital School of Arts & Wellness. The vision of the partnership is to create a nationally leading center of excellence for performing arts and wellness education for the mind, body and imagination. The combination of arts and health make up a diverse, multidisciplinary field that transforms health and wellness by connecting people with the arts throughout key moments and milestones in their lives. The Dr. Phillips Center Florida Hospital School of Arts & Wellness will integrate literary, visual, dance/movement, music, and performing arts at the school itself as well as into a variety of healthcare and community settings for therapeutic, educational, and expressive purposes. As part of the partnership, an Arts and Wellness Advisory Council comprised of five national and community leaders will be formed. Members include the CEO and President of the Dr. Phillips Center, a Florida Hospital representative, Margery Pabst-Steinmetz, a healthcare clinical specialist with arts and wellness expertise appointed by Florida Hospital, and a nationally recognized arts educator, and an administrator or philanthropist selected by Florida Hospital and the Dr. Phillips Center. In the first year the Council will develop a Strategic Plan that defines the programming for the arts center’s educational arts and wellness initiatives. 1. To explore, integrate, and foster the ability of expressive, performing arts to further health, well-being, and quality of care for individuals, families and caregivers. 2. To empower individuals, communities, and vulnerable populations with challenging conditions such as autism, dementia, Alzheimer’s disease, trauma, chronic illness, mental health, anxiety disorders, age-related conditions, and other conditions, through direct and innovative performing arts-based programs and curriculum. 3. To realize the potential of performing and expressive arts to further social change and public health. The Dr. Phillips Center and Florida Hospital hope that by working together, they can not only inspire wellness, but be a catalyst for creative and resourceful change in Central Florida. Opened in 1908, Florida Hospital is a faith-based institution focused on providing whole person care. It is one of the largest not-for-profit hospitals in the country, caring for more than two million patient visits per year – more than any other hospital in the country, according to the American Hospital Association. The Florida Division of Florida Hospital stretches from coast to coast with 24 hospitals, more than 4,600 patient beds, and more than 32,000 employees. The division includes the Walt Disney Pavilion at Florida Hospital for Children, dozens of outpatient facilities and 26 Centra Care urgent care locations throughout Central Florida. The Dr. Phillips Center for the Performing Arts is a nonprofit 501(c)3 organization operating the new state-of-the-art performing arts center in downtown Orlando, Florida. With its opening in November 2014, the performing arts center launched its vision of Arts For Every Life® by being a gathering place for creativity and discovery; a vibrant urban destination where artists, audiences and students come to experience, explore and learn. The two-block community destination features the 2,700-seat Walt Disney Theater, 300-seat Alexis & Jim Pugh Theater, Seneff Arts Plaza, School of Arts, the DeVos Family Room, and other event rental spaces. Future expansion plans include a 1,700-seat Acoustical theater, rehearsal room and commercial development spaces. The Dr. Phillips Center is a public-private collaboration with the City of Orlando, Orange County, the State of Florida and generous donors. For more information please visit drphillipscenter.org. A collection of photos from the announcement are available for use by the media and are located on Flickr.